If skewers are wooden, place them in a bowl of water soaking for about 30 minutes before using. In a small bowl, whisk together cornstarch and 1/4 cup of water and set aside. In a small saucepan over medium heat, add soy sauce, brown sugar, ginger, garlic powder, honey and 1 cup of water; bring to a simmer. Stir in cornstarch mixture until thickened enough to coat the back of a spoon, about 2 minutes; let cool to room temperature. Split mixture into 3 portions. One will be to marinate the chicken; one to marinate the peppers and onions and the third will be to drizzle on top of the kabobs when serving. In a Ziploc bag or large bowl, combine teriyaki marinade and chicken; marinate for at least 30 minutes or overnight, turning the bag occasionally. Add the peppers and onions to the marinade and set aside. Preheat grill to medium-high heat. Thread chicken, peppers and onions onto skewers, leaving room at each end to hold it, repeating process until there are no meat and vegetables left. 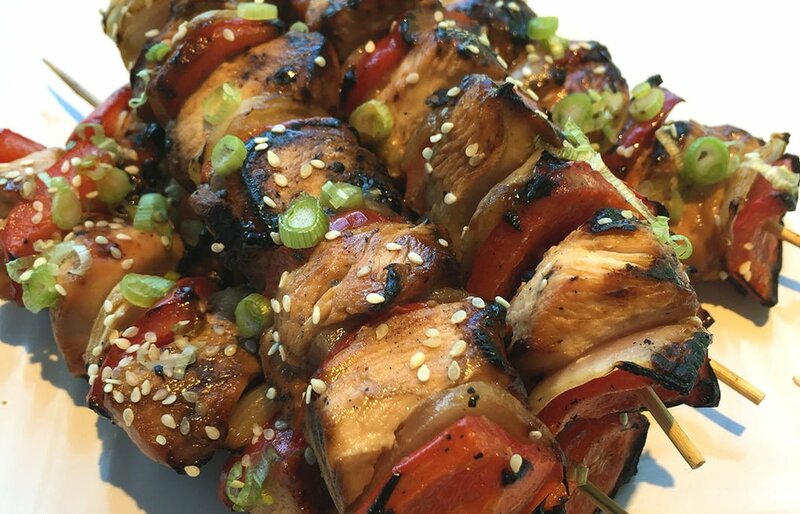 Place skewers on preheated grill and cook about 3-4 minutes per side or until cooked through. Serve immediately, garnished with sesame seeds and green onion, if desired.